The Ultimate Screen Clock will manage time on your system as few applications have managed it before or since. While this software has been certified as being incapable of actually violating any physical laws — or at the very worst, just fracturing a few of the complex ones only physicists understand — it will do things with time that would have been the stuff of myth a few short centuries ago. Admittedly, a few short centuries ago there weren't a lot of computers around to run clock software. The Ultimate Screen Clock will integrate an attractive graphic clock with your Windows desktop. You can configure the appearance of your clock, selecting from a library of digital and analog clock styles — or you can design your own. One of the most powerful features of The Ultimate Screen Clock is its Net Time option. It can be configured to set your system clock to the accuracy of an atomic time standard by accessing one of its Internet-based time servers. The Ultimate Screen Clock also includes a sophisticated reminder feature to notify you of important events. You can use as many or as few of the features of The Ultimate Screen Clock as you wish. The software is easy to configure, and exceedingly flexible. The above graphic illustrates some of the clock styles included with The Ultimate Screen Clock. To view them in somewhat less chaotic surroundings, you might want to check out the clock style list. 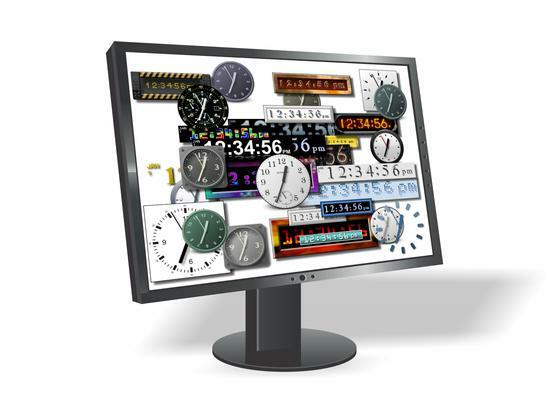 Integrate your choice of attractive digital and analog screen clocks with your desktop. Be reminded of important events for up to a century in advance — alert your descendants. Set your system clock over the internet with the accuracy of an atomic time standard — breathtaking precision, no messy radiation burns. Schedule other Windows documents and applications with unsurpassed ease. Keep your screen unpredictable — The Ultimate Screen Clock can be configured to change its appearance periodically. Be a local time server for your intranet, peer-to-peer network or personal network. Be a precise digital stopwatch, accurate to one tenth of a second. Be an equally precise digital countdown timer. Optionally display its clocks in a Windows screen saver. Display clocks for multiple time zones. Our server's clock is updated daily from the same atomic time standards The Ultimate Screen Clock accesses. If the two times shown above aren't identical to within a few seconds, you need The Ultimate Screen Clock to keep your system clock accurate. These times are expressed in coordinated universal time to allow for your local time zone. IMPORTANT: The Ultimate Screen Clock requires access to the Internet to validate itself after installation. Please see the discussion of registration key security for a detailed discussion of this functionality. Click on one of the following links to download The Ultimate Screen Clock 9.0a revision 3. This file is 89,584,640 bytes in length. The Ultimate Screen Clock Extra Styles will add still more clock styles to The Ultimate Screen Clock. Once it's installed, use the Styles item of the right-click menu to see your new styles. Note that you must have a registered copy of The Ultimate Screen Clock to install The Ultimate Screen Clock Extra Styles. As of this writing, if you have previously registered or upgraded to The Ultimate Screen Clock 8, we invite you to upgrade to The Ultimate Screen Clock 9 for half price. We are able to provide some limited support for the version 8 software, but it's becoming increasingly vulnerable to changes in Windows and some third-party security products. The Ultimate Screen Clock 4, 5, 6 and 7 have reached their ends-of-life, and they have been removed from distribution. We no longer have replacement installers for these products. We are able to provide replacement registration keys and limited support for The Ultimate Screen Clock 7. We recommend that you register The Ultimate Screen Clock 9. The Ultimate Screen Clock 2 has reached its end-of-life, and it has been removed from distribution. We no longer have replacement registration keys or installers for this product, and support for it has ended. We recommend that you register The Ultimate Screen Clock 9. The Ultimate Screen Clock™ is a trademark of Alchemy Mindworks Corporation.